Time to highlight a few past posts for anyone who may have stumbled upon this blog recently. If my ever-growing list of things to post about is any indication, Thought Offerings will not be in hibernation forever.... that said, I don't know how soon real posting activity will resume. On my list are specific posts about the usual macroeconomic blog fare: interest rate policy foundations and effects, economic growth dynamics, job guarantee versus job or income guarantee, confusion about flows versus changes in flows, dynamics of inflation, debt and demographics, money supply dynamics, and more. If you've been subscribed to this blog via Google Reader and haven't yet chosen a new RSS feed reader (with Google Reader going offline very soon), I suggest giving NewsBlur a try. It's a little buggy still but seems very promising, with both mobile app and full web versions. Alternate suggestions are very welcome though -- I only recently started looking at current options. I have seen a handful of bloggers refer to the possibility that interest rate policy might work primarily through the housing channel, but I've never seen anyone detail how that might be true. Here are my previous thoughts on the mechanics (but with the bottom line that monetary policy is still mostly a placebo): Cutting Interest Rates to Boost the Economy: A Fallacy of Composition just like the False Notion of Cutting Wages to Create Jobs? Some thoughts on a specific MMT-style job guarantee program that could be highly beneficial to sustainable economic growth, and possibly more politically palatable than a more open-ended JG program: The Ultimate Job Guarantee Implementation: Can we Achieve Zero Wasted Labor AND Zero Material Waste Simultaneously?!? and The Zero Waste Jobs Program Revisited: Can We Recycle Over 80% of Trash Instead of Under 35% While Ending Involuntary Unemployment? The Japan stagnation thing is a myth that even otherwise astute MMT bloggers have seemed to fall for (though I've been out of the loop more recently)... Yes, Japan's population growth has stagnated, but real GDP growth per capita shows things in a different light if looked at on a long enough timeline. Real GDP Per Capita and Myths about Japan's Stagnation and Myths about Japan's Stagnation Revisited. Those are a few of the ones that I'm most happy with and that I think remain most relevant despite being old. I've also done a series of 3-4 posts on QE and money supply endogeneity that I will try to revisit some time in the light of later data, though I'm not sure at this point whether the posts were on the mark, and I've since seen references to Kaldor and others on similar topics and have not fully explored them. Over at EconViz I've uploaded an unfinished tutorial I've been working on called, "Why Central Banks Don’t Control the Money Supply: A Visual Tour of the Macroeconomic Dynamics of Bank Loans, Reserve Requirements, Capital Requirements, and Cash Withdrawals." For regular readers of technical Post-Keynesian and/or MMT material, it likely won't be anything new -- at this point it's mostly an intro to the relationship between bank reserves and broad money supply that shows why the mainstream "money multiplier" view is mistaken. Cutting Interest Rates to Boost the Economy: A Fallacy of Composition just like the False Notion of Cutting Wages to Create Jobs? Does monetary policy work? Can the central bank meaningfully impact the economy and employment by altering interest rates? Or, as Warren Mosler sometimes suggests, are central bankers like the kid in the back seat turning the plastic steering wheel and thinking they are controlling the car? Either way, most mainstream economists are firm believers in the power of monetary policy as a tool for steering the economy. "So let me repeat a point I made a number of times back when the usual suspects were declaring that FDR prolonged the Depression by raising wages: the belief that lower wages would raise overall employment rests on a fallacy of composition. In reality, reducing wages would at best do nothing for employment; more likely it would actually be contractionary. "Here’s how the fallacy works: if some subset of the work force accepts lower wages, it can gain jobs. If workers in the widget industry take a pay cut, this will lead to lower prices of widgets relative to other things, so people will buy more widgets, hence more employment. "But if everyone takes a pay cut, that logic no longer applies. The only way a general cut in wages can increase employment is if it leads people to buy more across the board. And why should it do that?" "...the belief that lower interest rates would raise overall employment rests on a fallacy of composition. In reality, reducing interest rates would at best do nothing for employment; more likely it would actually be contractionary... The only way a general cut in interest rates can increase employment is if it leads people to buy more [e.g., houses] across the board. And why should it do that?" Word games do not a proof make, but let's work through how this fallacy of composition might apply in the case of interest rates as well as wages. "Back in the old days, when dinosaurs roamed the earth and students still learned Keynesian economics, we used to hear a lot about the monetary “transmission mechanism” — how the Fed actually got traction on the real economy. Both the phrase and the subject have gone out of fashion — but it’s still an important issue, and arguably now more than ever. "Now, what you learned back then was that the transmission mechanism worked largely through housing. Why? Because long-lived investments are very sensitive to interest rates, short-lived investments not so much. If a company is thinking about equipping its employees with smartphones that will be antiques in three years, the interest rate isn’t going to have much bearing on its decision; and a lot of business investment is like that, if not quite that extreme. But houses last a long time and don’t become obsolete (the same is true to some extent for business structures, but in a more limited form). So Fed policy, by moving interest rates, normally exerts its effect mainly through housing." "As I said then, there’s a definite change in the character of recessions after the mid-1980s. Before then, recessions were basically brought on by the Fed, which raised interest rates sharply to curb inflation, causing a slump in housing. When the Fed decided that we had suffered enough, it let rates fall again, and there was a surge from pent-up housing demand. Morning in America! "Since then, however, inflation has been well under control, and booms have died of old age — or more precisely, they have died because of overbuilding and an excessive level of debt. The Fed is then in the position of trying to goose housing (which is the principal channel for monetary policy) even though housing may already be overbuilt (which was the point I was making, sarcastically, when I said long ago that the Fed has to create a housing bubble), and it is cutting rates from an initial level which isn’t that high. So the odds of running up against the zero lower bound are high, and recovery can be a long time in coming." The quote above further emphasizes the housing channel, but acknowledges that after a housing bubble that has ended with excess inventory, the the Fed's policy efficacy may be reduced. "2-4 cannot be moved forward and so are not inter temporal decisions the way the models treat them. Therefore, if savings are threatened, people will substitute into other stores of value such as fx or gold. They will not move consumption forward, as they cannot. This is not about consumption." Additionally, if it turns out that there is no transmission mechanism from interest rates (the main policy lever of a central bank) to economic growth (and possible resultant inflation), then why should people alter their behavior based on the proclamation of Fed officials that they might "target" higher inflation? Target how?!? Back to housing. We'll discuss a starting scenario (Scenario A) and four possible outcomes of monetary policy changes (Scenarios B, C, D, and E). Let's look closely at whether the housing channel EVER works (i.e., even when there has not been a recent housing bubble). Consider the diagram below of the relative quantities of different measures of housing: ownership (owned outright versus with a mortgage), vacancies (vacant versus occupied), and occupancy type (whether occupied homes are lived in by owners or renters). The diagram's format and example numbers were in part inspired by a graph featured at Calculated Risk, though I've chosen a slightly different way of showing things. How do the other blocks react so that the first three columns always remain the same total height? In step 2 of this scenario, more new houses are built to keep up with this demand. 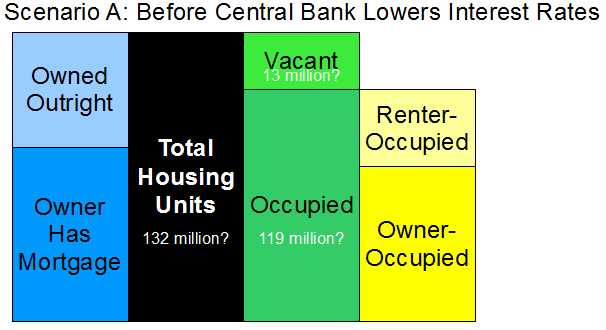 But as step 3 shows us, the result is more vacant homes, since the central bank wasn't able to manufacture more people at the same time as it lowered interest rates! What is the carrying cost of vacant homes? My cursory research suggests that in the US, property taxes range from 0.1% to 2% of a home's value (usually around 1%) and that annual maintenance costs fall in the range of 1%-4% of a home's value. 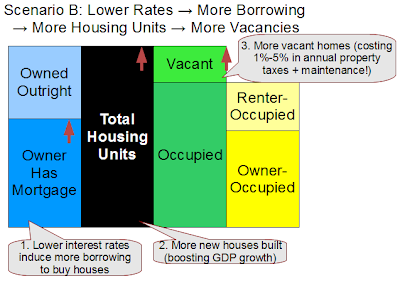 Even if we very conservatively assume the average carrying cost of vacant housing were only 2% of the home's value per year, who exactly is supposed to shoulder that cost burden without putting their "excess" (not lived in or able to be rented) housing inventory on the market, thus competing with new home sales, and counteracting the effect shown in step 2? Does this dynamic rely on highly inefficient markets, "irrrational" individuals, or sufficient time lags to induce a temporary spurt of economic growth? It seems plausible (to some degree) but not entirely convincing. There is a situation in which it seems reasonable to assuming a growing supply of vacant homes -- during a housing bubble. The reason is that if home values are appreciating fast enough, home owners will overlook the annual carrying cost of the homes and assume that they are a profitable "investment" due to the unrealized capital gains. But housing bubbles are not the norm! Is the inventory held tax free by home builders? Probably not -- on aggregate nationwide, they are unlikely to build excess homes if there aren't sufficient buyers in the pipeline. Here's an alternate scenario to consider. 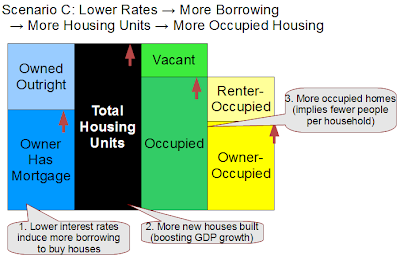 In Scenario C (diagram below), steps 1 and 2 are the same as Scenario B (lower rates lead to more homes bought with mortgages), but in step 3 people are motivated by the lower mortgage rates to move out of shared multi-person housing and into newly purchased homes, reducing the average occupancy rate. So this is a scenario in which monetary policy could credibly have the intended effect on economic growth via the housing channel as more homes are built, creating more jobs and higher GDP. But how large is this dynamic? How many households have gainfully employed individuals (who would qualify for a mortgage) just waiting to move out of their friend's house or parents' basement when rates get low enough? Let's consider a third scenario. After the central bank lowers interest rates, more people buy homes by taking out mortgages. But on average, owners who had no mortgage are net sellers (perhaps there is a relative portfolio shift by this demographic, on average, to other choices of assets). 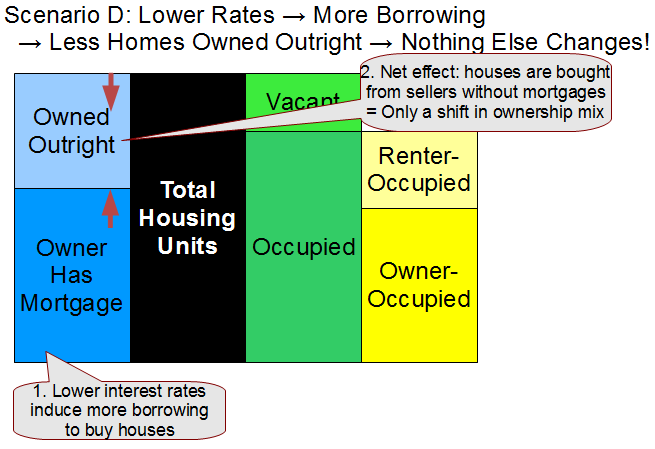 So in Scenario D, all that occurs is a shift in overall ownership mix between owners with mortgages and those without! There is no impact on economic growth or job creation! Lastly, let's consider the possibility that lower interest rates have the effect of raising housing prices above what they otherwise would have been, since buyers obtaining mortgages would potentially qualify for a larger loan amount, allowing them to bid more for houses. 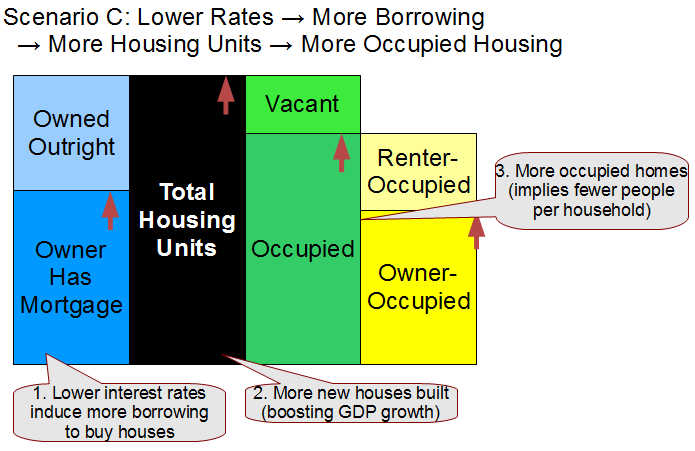 To the extent that this occurs, lower interest rates wouldn't have as large an effect in lowering housing affordability (monthly payment) as the interest rate changes alone would suggest, and this scenario's diagram would look just like the original -- Scenario A... unchanged, with no meaningful effect on GDP. In reality interest rate changes almost certainly aren't completely offset by housing price changes in this way, but there could be a partial effect along these lines! Changes in interest rates might have impacts on other prices in the economy. For example, asset prices could change, driving changes in behavior due to portfolio and wealth effects. Savings rates might change -- for example when rates are lowered people need to save more to achieve savings goals such as for retirement, thus hurting GDP growth. Since the government is a net payer of interest (on government debt), lower rates reduce income payments to the private sector, also hurting growth. But interest rates paid between borrowers and lenders (both in the private sector) can also be impacted, causing distributional shifts. The point is that interest rate changes can have effects, but monetary policy is what MMT economists call a blunt instrument, and the overall effects are very difficult to determine. Which scenario, B, C, D, or E is the most likely outcome of changes in interest rates with respect to the housing market? Are there other reasonable scenarios not covered in this post? Why do mainstream economists such as Paul Krugman recognize the fallacy of composition when it comes to whether lower wages will create jobs, but believe that lower interest rates have so much power over economic growth? I would guess that in reality a mix of all four scenarios (B, C, D, & E) occurs. Given the limited macroeconomic impacts of each scenario, the bottom line is that the power of interest rates to affect economic growth and jobs appears very small. Could it really be true that the tool most readily used to manage the economy is a policy lever whose success depends as much as anything on bribing a few employed young adults to move out of their parents' basements, while at the same time exerting other contractionary effects on the economy that the mainstream fails to discuss?!? UPDATE (same day): Moved an incongruous paragraph and assigned it to a new Scenario E, with minor rewriting. Also added one sentence within "Other Economic Impacts." While recognizing that most of this blogosphere discussion has passed me by months ago, I thought I'd share my perspective, redundant though it might be. "Can you have MMT without a Job Guarantee?" The question phrased this way is a bit too ambiguous for my taste... 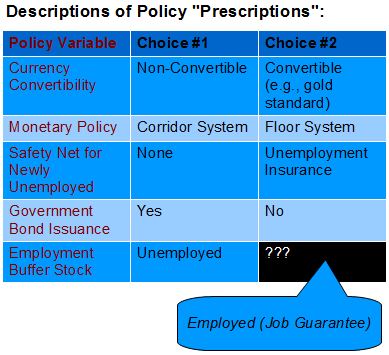 I view the job guarantee as a description of a policy prescription. I agree with those who consider the job guarantee description to be integral to MMT, but I believe actual policy recommendations (prescriptions) can always differ by individual. A full description of the economy (as you might find in a good macroeconomics textbook) should discuss both the agreed upon and the controversial pros and cons of each policy choice. For example, even mainstream macroeconomics textbooks discuss their own versions of the difference between being on a gold standard and not, the choices for social safety net implementations (such as unemployment insurance), etc. Yet there are plenty of advocates for going back to a gold standard and/or completely removing the safety net -- so there is no universally agreed upon policy choice in any of the above examples. In a sense, to not describe all the relevant policy choices in the context of discussing a particular policy-related topic would be to advocate for the remaining choice(s). Thus, while I have some [small?] reservations and concerns about the job guarantee myself (despite my giving it the benefit of the doubt overall), I'm doing my best to communicate the pros and cons of each choice (including points of controversy) as I build content on EconViz.org. To address a possible objection -- yes there are policy choices not on the above list that don't warrant description of each policy choice (e.g., "should government provide puppies for everyone?"). But MMT has shown all the above examples (and others) to be highly relevant to the goals of national governments. It's my understanding that all current MMT-affiliated professional economists consider the employed buffer stock to be a superior policy choice to the unemployed buffer stock, thus it's no surprise that they highlight the JG the way they do in the econoblogophere (a much more informal medium than academic papers). I think they have every right to express opinions along the lines of "you'd be crazy to know about this policy option [JG] now available to most monetarily sovereign nations and not to advocate using it" in the same way that mainstream economists express individual opinions about the gold standard, minimum wage laws, etc. And I think it's perfectly valid for any individual who discusses the economy in the light of MMT to judge that the "cons" of the JG concept outweigh the "pros" -- as long as that person is explicitly acknowledging both buffer stock options and describing the detailed reasoning behind his or her conclusions. In case I haven't been clear enough, this is my personal perspective. I make no claims that this post is consistent with the way MMT professionals view this topic. The Zero Waste Jobs Program Revisited: Can We Recycle Over 80% of Trash Instead of Under 35% While Ending Involuntary Unemployment? "What if the role of job guarantee work was to "intercept" the not-currently-recycled part of the waste stream with the goal of reclaiming recyclable, reusable, and organic (compostable or biofuel-ready) materials to the maximum extent possible?" "To repeat, the high level aspiration outlined here is to "kill two birds with one stone" by matching the goal of reducing human labor waste (involuntary unemployment) with the goal of reducing other external costs currently borne by society. This post focused on the "other external costs" related to materials flow and associated environmental sustainability, but are there other large-scale external costs a JG could potentially address?" "Americans generate more trash than anyone else on the planet: more than 7 pounds per person each day. About 69 percent of that trash goes immediately into landfills. And most landfill trash is made up of containers and packaging — almost all of which should be recycled, says Pulitzer Prize-winning journalist Edward Humes,"
"In a difficult economic environment, it's just crazy to take all this material and just bury it in the ground." "The real solution is just to stop putting so much stuff in giant burial mounds, but that's a really tough nut to crack." "On the outskirts of Cairo lies the world's largest garbage village. A labyrinth of narrow roadways camouflaged by trash, the village is home to 60,000 Zaballeen — Arabic for "garbage people." The Zaballeen have survived for centuries by recycling Cairo's waste. Members of Egypt's minority Coptic Christian community, these entrepreneurial garbage workers recycle nearly all the trash they collect, maintaining what could be the world’s most efficient waste disposal system. With a population of 18 million, Cairo — the largest city in the Middle East and Africa — has no sanitation service. For generations, the city’s residents have paid the Zaballeen a minimal amount to collect and recycle their garbage. Each day, the Zaballeen collect more than 4,000 tons of garbage and bring it for processing in their village, where plastic granulators, cloth-grinders, and paper and cardboard compactors hum constantly. As the world's capacity to generate trash skyrockets, Western cities boast of 30 percent recycling rates — admirable, until you compare it with the 80 percent recycling rate the Zaballeen can claim. In 2003, following the international trend to privatize services, Cairo sold multimillion dollar contracts to three corporations to pick up the city's garbage. Shimmering waste trucks now line the streets, but these multinational waste disposal corporations are only contractually obligated to recycle 20 percent of what they collect, leaving the rest to rot in giant landfills. As these foreign companies came in with waste trucks and begin carting garbage to nearby landfills, the Zaballeen watched their way of life disappearing." "... Unfortunately, the ability of the Zaballeen to both acquire and process Cairo’s garbage has become harder in the last few years. Cairo’s Zaballeen are still locked out of the trash trade by the multinational companies that arrived on the scene several years ago as part of the Egyptian government’s failed attempt to overhaul the municipal waste management system." "The Zabbaleen community is characterized by both low health and high rates of disease, especially those related to their garbage collecting activities." The assumption that more labor can enable more recycling appears accurate -- the Zaballeen were recycling 80-85% of Cairo's waste stream, versus as little as 20% for the corporations that replaced them. The incentives and guidelines in place for these multinational waste disposal corporations (profit for shareholders plus whatever basic rules and regulations they have to meet) probably are NOT well aligned with the well being of the planet. Based on my admittedly superficial consideration to date, this certainly seems like an area that governments should be more actively involved in (in some countries, I believe they are, but I have not researched the details). Might not a specialized job guarantee be one feasible means of achieving public purpose here? (Note: I'm not arguing that the only way a Job Guarantee program could be beneficial is by focusing on reducing external costs in this way). Surely a modern first world country such as the US has the resources to equip Zero Waste Jobs Program workers with adequate tools and safety equipment to minimize health risks? The Zaballeen's only sources of income were very low fees charged to residents, plus the waste material itself (selling it or products made from it) -- yet they achieved a lot with very little. I'd be glad to hear comments, though you might first scan the previous post's detailed list of pros and cons related to this idea (it includes recognizing the merits of source separation and of consumers reducing their own waste streams, the merits of automation when possible, social stigma concerns, etc). It would also be interesting to hear if anyone has more detailed knowledge on this topic -- such as on the economics of the waste industry or on practices outside the US that demonstrate potentially preferable alternatives to tackling these problems. UPDATE: Minor edits for clarity plus added one sentence at the end. In case you missed it, yesterday I introduced a preview of the Macroeconomic Circular Flow Visualizer via a post on EconViz (read the linked post to see more on possible future features and such). Since I don't always get around to writing the longer ThoughtOfferings posts that linger on my "to do" list, I've been thinking of posting a (still infrequent) mix of bite-sized observations on macroeconomic dynamics. (Hey, the blog is called thought offerings!) Some of them may be inspired by the EconViz visualizers. They are unlikely to be novel, and apologies if I state the obvious too often. But, if there's an occasional observation I can't remember having seen discussed explicitly elsewhere and that I find interesting, then perhaps others will find it interesting too. And if you think I draw incorrect conclusions at any time, please speak up! Here's one for today on the full autonomy of macroeconomic flow injections. The circular flow visualizer shows in green the three injections -- government spending, investment, and exports. A Post Keynesian revelation is that the injection of business investment has no dependency on the past leakage flow to saving (i.e., on the current quantity of savings). The mainstream believes you need savings to fund investment and also that central bank policy levers play a big role here. A MMT revelation is that the injection of government spending has no dependency on the past leakage flow to taxes (or on the whims of bond markets). Exports are "funded" thanks to foreign countries' circular flows of income, so combining the previous two revelations, the injection of export spending has no dependency on the past leakage to imports. (At least with floating currencies, governments sovereign in their own currencies, etc...) A question I don't know the answer to -- does the mainstream macroeconomics profession in countries with persistent trade surpluses worry about foreigners running out of funds to buy their exports??? (Since they'd believe those foreign economies' other two injections have constraints).